This is what happens when you let your children play with the Christmas decorations. 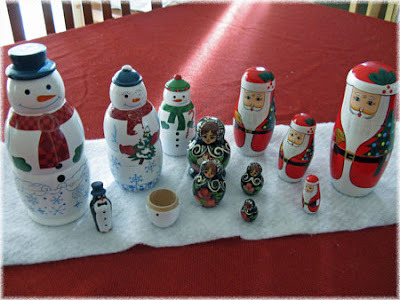 We've been missing one of the snowman's heads since last Christmas on our wooden nesting doll set (the Russian word is matryoshka). I love nesting dolls. I still have a set that I got during a high school trip to Russia. I'd love to find winter or holiday themed ones. Poor snowman! I could see that happening in my house too! Definitely creates a conversation piece.